A new organization leading research in yoga’s positive effects on diverse populations has evolving design needs including brand and logo development, identity and diagnostic visual system refinement, and promotion. Need: An identifier for a non-profit focused on research, yoga, and improving people’s lives. Solution: The circular form represents the organization’s open approach to teaching and dedication to inclusivity. A stylized lotus blossom reflects the roots in yogic practice. The bright field of yellow, green and blue connects to the natural environment and a sense of joy. Founder Paul Mross developed the Happ:y name and its emoji reference. The designed wordmark uses modified letterforms from the Humanist typeface, Optima. Need: A visual presentation of the system developed for measuring improvement in yoga students’ balance and stability. Design solution: Following information from user experiences in the field, I worked iteratively with Paul over many weeks to achieve a unified visual vocabulary for the yoga mat’s markings. To assert the brand, the logo was applied to the mat in a way to harmonize with the system of marks. A vibrant color palette was chosen for The Happ:y Yoga Mats. Need: Instructional tools for students and teachers to be used in a variety of settings and with different audiences sizes. Solution: Paul experimented with a number of materials and prototypes. The system in development uses a full-size base marked like the yoga mat and separate magnetic hands and feet as movable teaching tools. Need: An appealing informational document to promote The Happ:y Yoga Mat to priority customers. Solution: Copy editing and strong hierarchy was used to unify and clarify the content. For cost effectiveness and ease of printing, it was designed on letter-size with no bleeds. This City of Stevens Point department runs a bus system that serves permanent residents and college students. The management is engaged in periodic assessment and improvement of service. Updates to bus routes and redesign of map information occurs on a regular basis. Need: Clean visual system for displaying arrival times and bus stops for six different routes. Solution: A new alignment structure was devised for distinguishing the routes and an easy to scan space conscious arrangement was created for the timetables. New typefaces and styles were employed for increased readability. On the main bus system Rider Guide, Campus Routes are shown on one side of the map and Regular Routes are on the other. Need: An icon system that clearly marks and clarifies routes, stops and area locations. Solution: Specifically shaped and color-coded icons were designed to designate the individual bus routes for both Regular and Campus routes. Time point and bus stop markers were revised, as were arrows indicating route direction. New icons for categories of area business landmarks is used to help riders geolocate. Need: Late Night Transit (LNT) is a bus service from campus area to downtown developed to provide a safe alternative for students and employees working the late shift. The original map was printed on Legal-sized paper and folded up to a typical brochure size. It was not reaching the intended audience, college students. Solution: A pocket-size folding structure was designed for convenience. Graphics were designed to be friendlier, cuter, and to communicate clearly, ‘bus’ and ‘night time.’ Copy was rewritten and type hierarchy was beefed up to clarify information, make the design more scannable, and make wording more punchy. Need: Easily readable visual map. Solution: The new rider’s guide design uses two strong colors and simple triangle markers pointing in the corresponding direction for the North and East routes. Times of bus departure are indicated next to each bus stop. The system keeps it simple and employs larger icons and type point sizes for the weary or bleary late-night eyes. 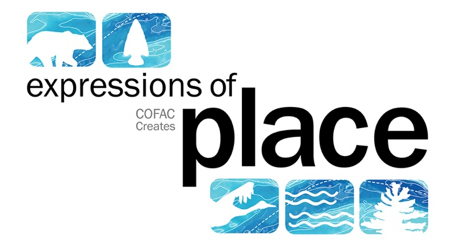 An interdisciplinary event series named COFAC Creates is a featured program in the College of Fine Arts & Communication bringing many disciplines and points of view together. 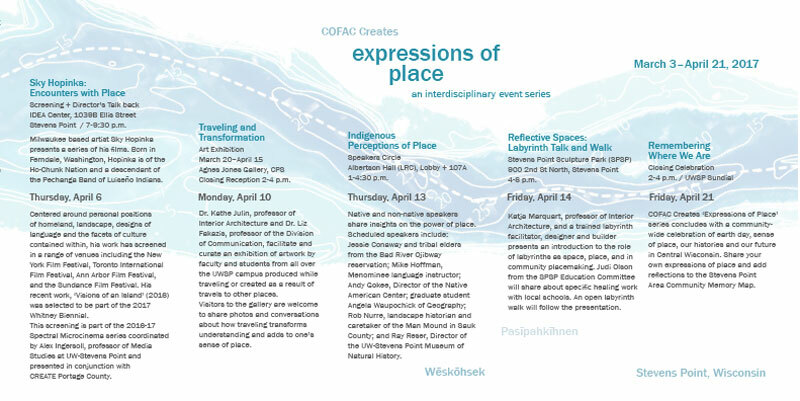 In spring 2017, I coordinated ‘Expression of Place’ encompassing 11 different events, and art directed the design and application of the identity. Interior of main brochure for the Expressions of Place series.